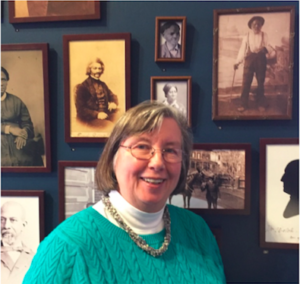 Rhonda Forristall, curator of the Deep River Historical Society and author of Billy Winters, One Man’s Journey to Freedom. 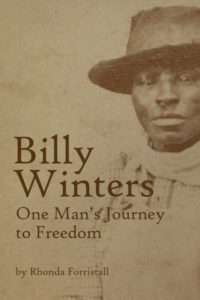 DEEP RIVER — The Deep River Historical Society has announced the publication of a second book called Billy Winters, One Man’s Journey to Freedom, written by Rhonda Forristall, curator of the Society. Historians often say that “history repeats itself” so is it really a surprise that 117 years after the death of Billy Winters that his story is still current? The news is full of stories of those seeking a new life in Connecticut and sanctuary cities offering help and support. Billy found both in Deep River. Born a slave, Billy escaped through the Underground Railroad and sought a safe place to live. He found sanctuary in Deep River and for a time in New Bedford, Mass. The Boston School of Architecture has just completed a three-month-exhibit about the African-American neighborhood in New Bedford that gave sanctuary to self-emancipated slaves from 1840 to 1863. Frederick Douglass and Billy were only two of the thousands that were sheltered there. Billy told the story of his eventful life to a reporter for the Deep River New Era shortly before he died in November of 1900. Using this first-hand account Rhonda was able to trace his steps and add some details to Billy’s story. Due to the secrecy needed to protect the operators of the Underground Railroad, and those they were trying to save, there are very few first-hand accounts in existence. The Deep River Historical Society is privileged to have this account at the Society and an obligation to preserve his story for future generations. This story has been a significant part of the presentations that the Society provides to the Deep River Elementary School 4th graders when they visit each year. While not written as a children’s book, it was important to Forristall to write this story in such a way that the students would be able to read and understand it. Although the story of Billy Winters is known by many, Forristall’s research has turned up a few surprises. The Society is hosting an author event on Sunday, March 11, at 4 p.m. in the Carriage House. All are welcome.